Qatar joined OPEC in 1961 - a year after OPEC was founded - so why did they join, and why did they leave at the end of 2018? Qatar was the smallest OPEC member for population (only 2.7 million) and area (12,000 square kilometres). It is a tiny country sticking out into the Persian Gulf with only one short land border to the south west with Saudi Arabia. Bahrain is to the North and the UAE to the South. 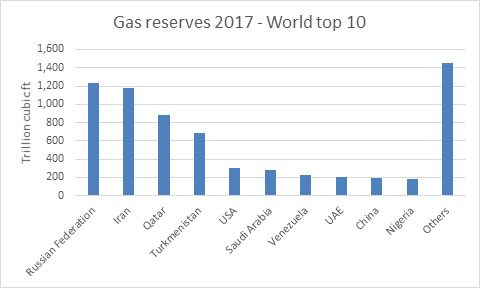 In 2017 BP ranked Qatar 14th in the world for oil reserves, but 3rd in the world for gas. According to BP, Qatar has reserves of approximately 25,200 million barrels of oil and 879.9 trillion cubic feet or 24.9 trillion cubic metres, only exceeded by Russia and Iran (but please note official reserves figures are disputed for all countries). What qualified Qatar as a member of OPEC? Qatar qualified to be a member of OPEC as they are a “country with a substantial net export of crude petroleum”. In 2017 they produced 600,000, and exported 466,000, barrels of crude per day, almost entirely to the Asia and Pacific region. And as for gas, Qatar marketed 163,599, million cubic metres of gas in 2017 of which they exported 128,645.3 million cubic metres. According to the IEA, OECD countries imported 106,908 million cubic metres of LNG from Qatar in 2017. Qatar’s customers were, in descending quantities of thousand million cubic metres: Korea (15.2); Japan (13.5); India (13.2); China (10.2); Italy (7); Chinese Taipei (6.5); UK (6.2); Egypt (5.7). What do they earn from exports? According to OPEC, petroleum exports earned Qatar US $35,496 million in 2017. And the CIA estimate they earned a total of $67.5 billion from all exports - which included liquefied natural gas (LNG), petroleum products, fertilizers, and steel. Bloomberg reckons that expansion of Qatar gas exports will “generate $40 billion in additional export revenue” by 2024. Why did Qatar leave OPEC? The official reason given by Qatar for leaving is that they wish to concentrate on developing their natural gas industry. But commentators have speculated that they wish to get away from an organisation dominated by their neighbour Saudi Arabia, with whom they also have a long-standing border dispute. Trade restrictions were placed on Qatar by Saudi Arabia, the UAE, Bahrain and Egypt in June 2016, following “claims of and counter-claims of state-sponsored hacking, the promotion of fake news and support for terrorism”. Qatar has had to find other trade routes as they need to import machinery and transport equipment, food, and chemicals; as well as needing to export gas and petroleum. Some of these routes involve closer links with Iran, which further aggravates their relationship with Saudi Arabia. How does Qatar plan to develop their gas industry? Qatar has expansion plans for its North Field - the world’s biggest natural gas field Drilling is due to start in 2019 and gas production is targeted to reach 4.6 billion cubic feet per day. Will their refineries cope with the increase? Qatar has two refineries and is self-sufficient in petroleum products and gas, but for them to export gas it has to be converted to LNG. The QP refinery (or Qatar Petroleum Refinery) started as a small topping plant in 1958 but has developed into a refinery capable of processing 137,000 barrels per stream day (bpsd) and 57,000 bpsd condensate. Its main activity is to process crude oil and condensate into various finished products to meet domestic demand and for export. The main finished products are liquefied petroleum gas, petrochemical naphtha, premium gasoline, super gasoline, jet fuel, diesel, marine fuel oil, decant oil and straight run fuel oil. Qatar’s LNG capacity will rise from 77 million tonnes a year in 2018 to 110 million tonnes of LNG a year by 2025.